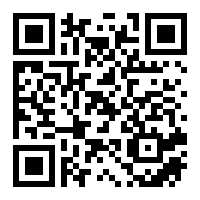 It's done! 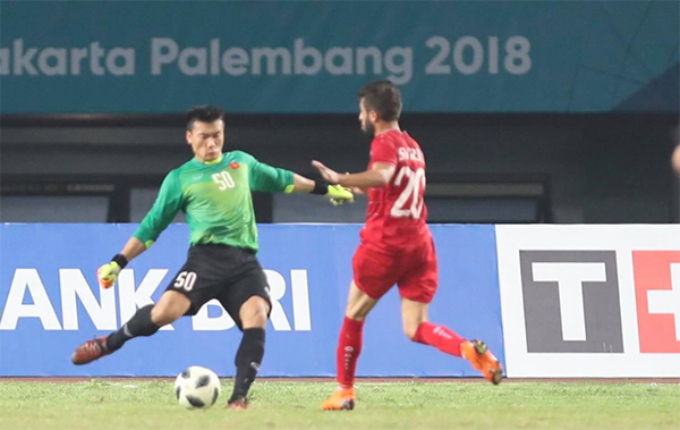 Vietnam is in the semifinals of the Asian Games 2018. 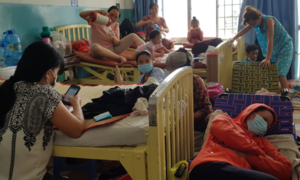 As the Syrians collapsed in tears, Vietnam has created footballing history again. 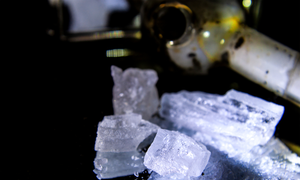 The nation is set to celebrate all night until the early hours of the morning with fans joyously delirious. Coach Park Hang-seo and the boys have done the nation proud, yet again. 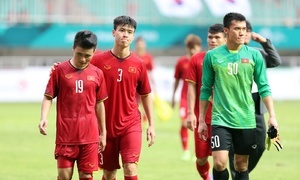 Vietnam's goalkeeper received the game's fifth yellow card in 119'. Vietnam received the fourth yellow card in 110'. Nguyen Van Toan celebrates his goal into Syria's net. 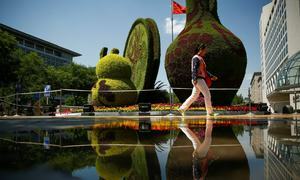 After the first period of extra time, the result was still 0-0. In 105'+1, Vietnam missed a target. 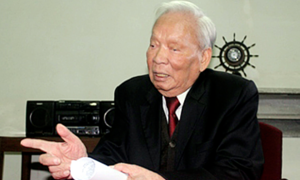 In 102', Vietnam had a shot saved by the goalkeeper. Vietnam received another yellow card in 91'. The main game closed with zero goals scored. The teams have entered extra time. In 90'+1, Syria took a corner which was neatly saved by the goalkeeper. In 78', Vietnam received the second yellow card. Vietnam missed the target in 76'. 20 minutes into the second half and Vietnam was apparently playing with caution, with not many major attacks. 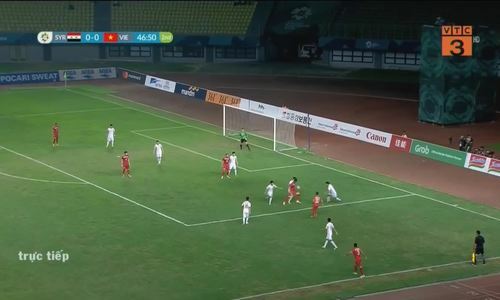 In 63', Vietnam struck a freekick saved by the goalkeeper. In 47', Syria had another shot saved by the goalkeeper. The teams have come back for the second half. 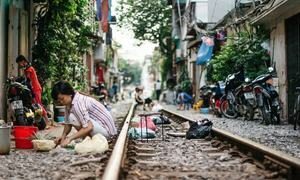 Back in Hai Phong in northern Vietnam, fans have been cheering for their national team under the rain. 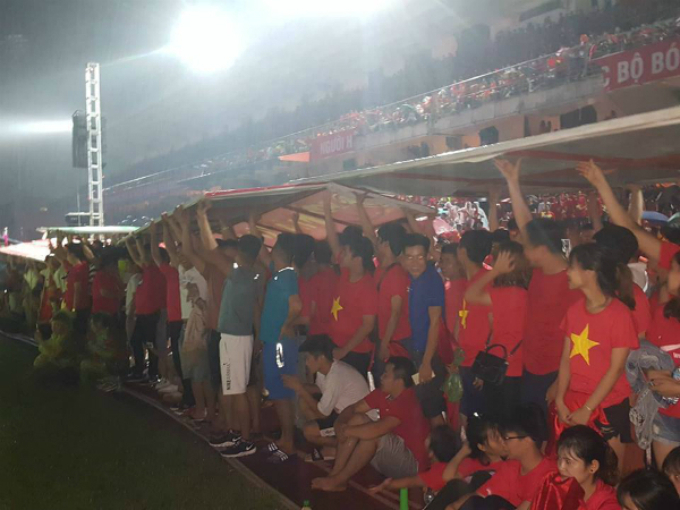 Vietnamese fans shield themselves from the rain as they watch the game live on a 150-square-meter screen at Lach Tray Stadium in Hai Phong. The first half closed after one extra minute, with no goals scored. In 42', Syria missed the target! 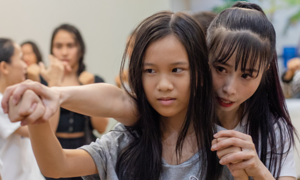 A strong shot that could have been hard to save. A strong shot from Syria that then flew right outside the net. 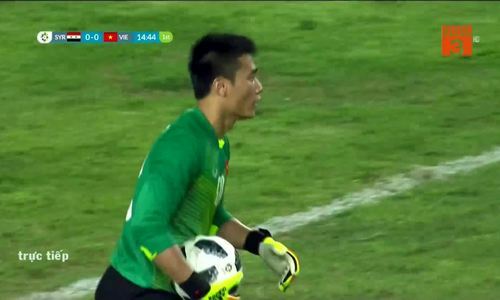 Vietnamese goalkeeper Bui Tien Dung saves a shot in 36'. Vietnam received a yellow card in 28'. 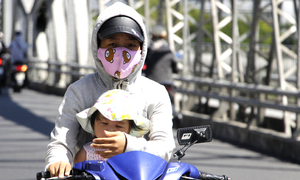 25 minutes into the game, Vietnam has launched several attacks that could not break through Syria's strong defense. In 15', Syria had a shot saved by the goalkeeper. Both teams have gone all out 10 minutes into the game. Two players fight for the ball. 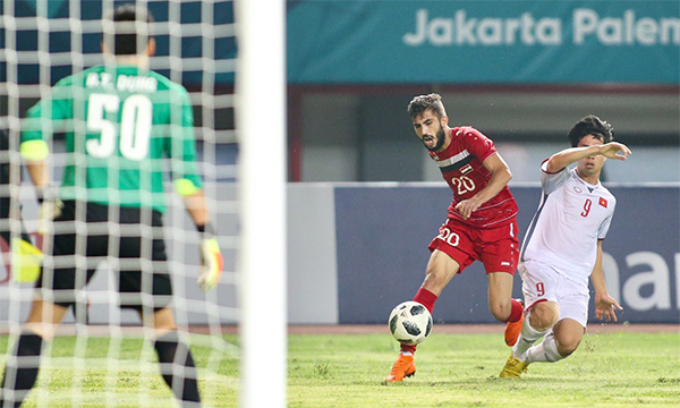 The game started at 7:30 p.m. at the Patriot Candrabhaga stadium of West Java, Indonesia, with Vietnam in white and Syria red. 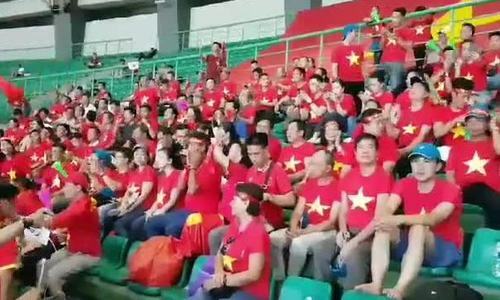 More than a thousand Vietnamese fans were at the stadium to cheer the men’s football team. 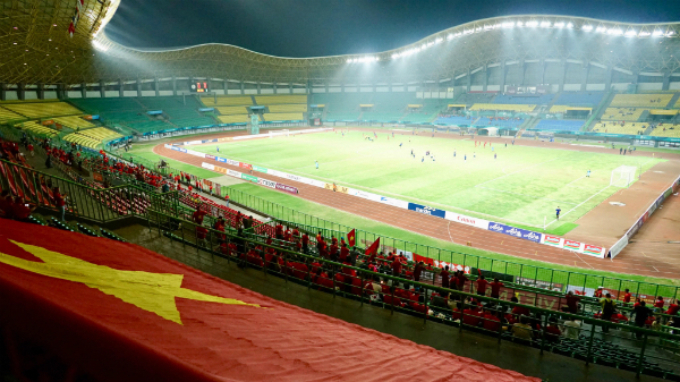 Vietnamese flag at the stadium. 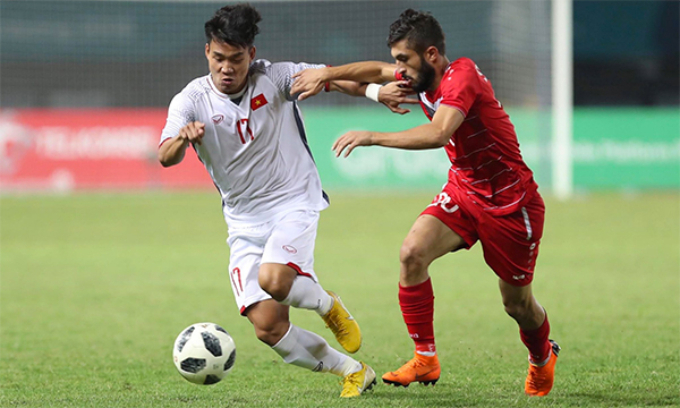 Vietnam entered the quarterfinals of the regional tournament for the first time, defeating Bahrain on the Thursday match with a goal in the 88th minute. 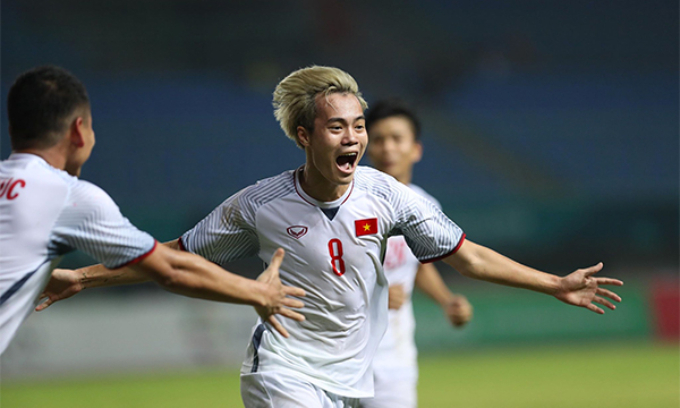 Nguyen Cong Phuong, who came off the bench late to score the goal, sent fans into a frenzy.